Through St. Clair Hospital’s clinical collaboration with Mayo Clinic, you as a patient, are able to receive a second opinion (eConsult) for a complex medical condition from a Mayo Clinic specialist at no cost. St. Clair physicians work closely with Mayo Clinic and are able to consult directly with a Mayo Clinic physician from any specialty. If you are interested in obtaining a Mayo Clinic second opinion, please speak with your St. Clair physician. Every day across America, physicians make hundreds of thousands of diagnoses in hospitals, medical offices, clinics and nursing homes. They listen to their patients, examine them, ask questions, obtain laboratory and other diagnostic tests, and consider the reports of consultants. Many factors come into play: symptoms, timing and sequence of symptoms, past history, family history, lifestyle, and recent exposure to disease, among them. Physicians synthesize all this information and interpret its meaning as they seek a cause for their patients’ symptoms. Using their senses, intellects, education, and the intuition born of experience, they diagnose. Making a diagnosis is like conducting an investigation, similar to detective work, believes G. Alan Yeasted, M.D., Chief Medical Officer Emeritus at St. Clair Hospital. Mark V. Larson, M.D., a medical director at the Mayo Clinic Care Network, of which St. Clair is a member, describes diagnosis in this way: “It’s like a jigsaw puzzle, where the image is revealed only after all the pieces come together.” Both of these longtime, experienced physicians agree that diagnosis is both science and art. It is a complex process, often painstaking, of narrowing the possibilities through a comparative analysis known as a differential diagnosis. Diagnosis determines the course of treatment and informs decision-making so that things can move forward, toward a cure, improved health, or the easing of suffering. A diagnosis can be many things, but one thing it cannot be is wrong. The wrong diagnosis can mean delayed, inappropriate or unnecessary treatment; time lost; complications that cause harm or injury to the patient, and even death. In 2015, the Institute of Medicine (IOM) issued a report, Improving Diagnosis in Health Care, a continuation of the landmark 2000 study of medical errors, To Err Is Human: Building a Safer System. The new study says that diagnostic errors are a blind spot in health care that has not been adequately addressed, despite the intense industry focus on patient safety and quality. The IOM estimates that 5 percent of U.S. adults who seek outpatient care every year experience a diagnostic error. 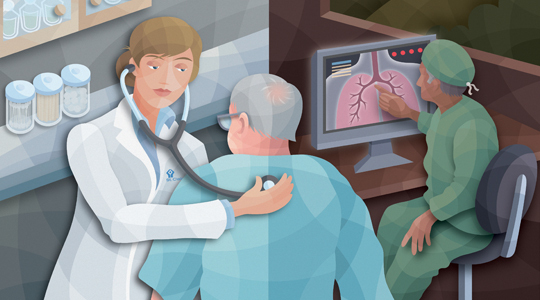 Reducing errors is not enough, the report says: the focus needs to be on improving diagnosis. But getting second opinions is not always a simple matter. Many obstacles exist: will my insurance cover a second opinion and, if not, can I afford it? Will my doctor be offended if I request one? How do I go about finding a doctor to give a second opinion? At St. Clair Hospital, no such obstacles exist. By virtue of its collaboration with Mayo Clinic, St. Clair has access to second opinions from experts in every specialty at the Rochester, Minnesota-based health system. One of the primary benefits of being a member of the Mayo Clinic Care Network is the opportunity for St. Clair physicians to connect, physician to physician, to discuss diagnostic challenges, rare diagnoses, and difficult clinical problems. Using electronic connections, St. Clair physicians can get feedback that enables them to confirm a diagnosis, validate the treatment plan, fine tune a diagnosis or treatment plan, or get suggestions for ongoing management of the patient. Doctors are finding the process easy and very useful, and patients are grateful for the expertise that these consults bring to their respective medical situations. For patients, Mayo Clinic eConsults are effortless: there is no cost, no need to travel, and no inconvenience. Physicians always want to do the best for their patients, and that includes getting a second opinion when it is appropriate. At St. Clair, the goal is to provide the best care possible. Through advanced technology and a spirit of collaboration, St. Clair is bringing Mayo Clinic’s expertise to the diagnosis and treatment of patients throughout the region.